Facebook can now be integrated directly into Mac OS X, letting you easily post stuff to Facebook from just about anywhere on the Mac. To setup Facebook integration in OS X, all you need is OS X 10.8.2 or later (full support is in Mountain Lion, Mavericks, Yosemite, etc) and a minute or so to get it configured. Once Facebook is setup in OS X, you’ll be able to post status updates from Notification Center, post directly to Facebook from Share Sheets, find your Facebook friends in Contacts, and even see a list of all Facebook notifications right in Notification Center. Sound good? OK great, here is how to set that up. If you want to make further adjustments to how Facebook interacts with Notification Center, just open the Notifications panel inside System Preferences, find Facebook, and configure alert styles, the amount of items shown, and the type of Notifications to receive. You can also determine whether or not the status updater appears in Notification Center. 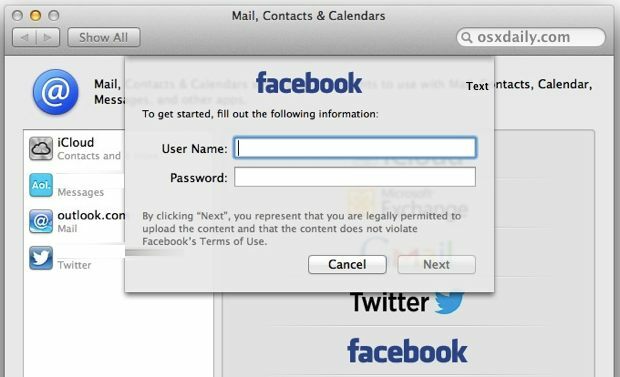 Now that Mac OS X has been configured with Facebook, you won’t need to login again when sharing items from the web or from your Mac or posting statuses from Notification Center. Facebook can be fairly distracting, so if you get tired of notifications just temporarily turn them off to give yourself some quiet time to focus. 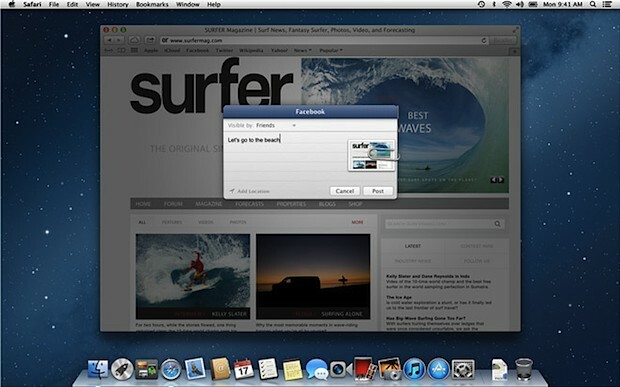 While we’re on the topic of Facebook, don’t forget to Like OSXDaily and follow us there too! Easy enough, though not sure why I’d really use this. A little frustrating, if I’m using it correctly. Am I right that I can’t post a message to a single, specific facebook user, i.e., only to myself or to groups of users? Thats how it’s supposed to work, it’s a shame it doesn’t for me and the hundreds of people posting on the apple community site. We can post to FB but aren’t getting any notifications at all. I am so sick of facebook. No, you can’t select the type of notifications to receive. Maybe with the Facebook developer preview you can, but with the official 10.8.2 release, it is not possible. Also, a lot of users are reporting that notifications often simply does not appears, even for new private messages in Facebook. For me it worked for few notifications, since then I don’t receive notifications for new PM. Is there a way to change the font color for posting to facebook/twitter in Mountain Lion’s notification center? I have dark wallpaper and the font is black so I can’t see what I’m typing. hmmmm….. I just tried this as per instructions…. because I have facebook set up to notify me of device log ins… I get a security txt message with a number sent to my phone…. there doesn’t seem to be any way to enter this? So I can’t complete this as per your description…. update….. instead of my password, I entered the security code sent to my mobile….. it worked. works way better than the Mountain Lion notifications. For those of you not getting notifications at all, I realized you have to be logged into Facebook in Safari. I tested it in Chrome and Firefox, but the only way I get notifications to show up is if I’ve logged into Facebook in Safari. Yet another way Apple forces us to use their applications. Hope this helps. how do i delete the apps accoiated with mac from my facebook, my ex had the mac and me the pc and now that we are not together i still see mac apps on my facebook apps recent activity page,, but they dont show up on my app page to edit or remove them, i think she has a messenger getting my messages..